Martin and Phil met when they both worked at Polymer Laboratories Ltd. in Loughborough. Phil had recently got into folk music and singing through his involvement in The Sealed Knot Society. When he discovered that Martin had played violin at school, he persuaded him to get it out. We started having regular music get togethers with John and Ruth Bradburn, and also started going to folk clubs, in particular the one run by John MacDonald and Tony Croft at The King William IV pub in Thurcaston. It was here that we met with Rose Gorringe and Edward Reeve. Rose and Phil shared a common interest, as they were both learning to play the anglo concertina. 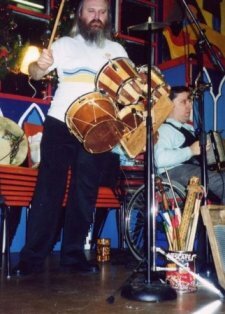 It was Rose who first put a Bodhran into Phil's hands, having seen him tapping along on the table top, and improvising percussion sounds using beer mats and pint glasses. Martin was fascinated with Eddy's melodeon, and he agreed to play fiddle in Eddy's band in return for some lessons on the squeezebox. The Acme Dance Company folded when Edward and Rose went their separate ways, and The Bang On The Wall Band was formed shortly after this. 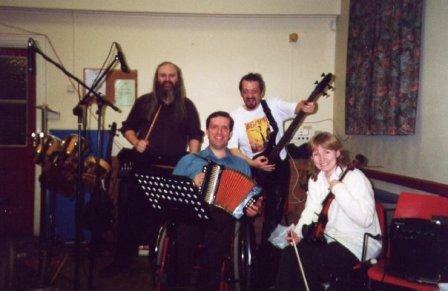 The first gig was at Castle Donington church hall for the local fete. 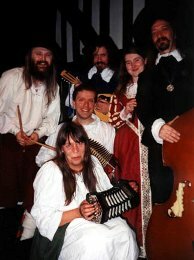 The band consisted of Martin on melodeon and fiddle, Phil on Bodhran, whistle and concertina, John on mandolin, Ruth on recorders, and Rose calling the dances and playing concertina. I don't think we got paid very much if anything at all, but I do remember the vicar, continually plying us with cans of beer. When Rose moved out of the area, we started working a lot with Roy White, and he was very good in the early days, helping us to get a suitable repetoire of tunes together for dancing. Roy was involved in running The Loughborough Folk Dance Club, and we still play there a couple of times a year, and also at the nearby Quorn Folk Dance Club. 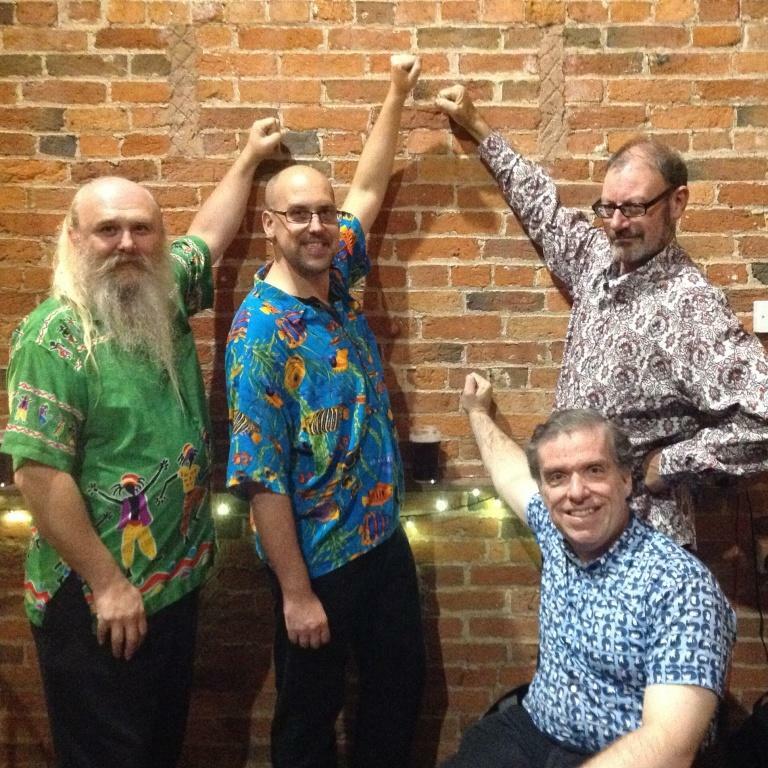 We like to support the dance clubs, but we're actually much more in our element at the more lively barn dances and ceilidhs. 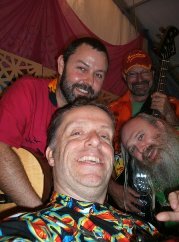 The band line-up varied quite a lot in the early days, but we eventually settled down to the basic format of Martin playing melodeon and Phil on percussion and whistle. We then completed the line-up with some combination of rhythm guitar, bass guitar and fiddle. Neil Cadwallader very soon became a regular member of the band, being able to play either guitar or bass. Michael Scrivens similarly played for us quite a bit until he moved away from the area. Peter Toms played bass semi-regularly with us for a while too. We also had Dawn Dawson on fiddle for a time. For many years the preferred line-up was Colin Keefe on Guitar and Neil on bass, and it was with this format that the band started getting more gigs. More recently Colin decided to pack in gigging, and fortuitously Michael Scrivens had moved back to the area, so we've got a really good solid line-up. Colin still occasionally deps in for us if Neil or Michael are not available, and we have a number of other bass players and guitarists that we work with regularly too. The name of the band comes from when we used to have regular rehearsals in Martin's front room. We always had to finish at 10 o'clock, and if we went on any later the next door neighbour would bang on the wall. This was a useful reminder that it was time to go to the pub.